We Are The They - And We're Not Going Away! You might have seen on Channel 4 last night a program called My Big Fat Wedding. The program followed a few plus size brides and their search for the perfect wedding dress. Pretty harmless you would think - just some very happy brides to be sharing some special moments from their big day. Sadly the world of social media did not agree. Instead Twitter became busy with people shocked at the very notion of plus size dresses. 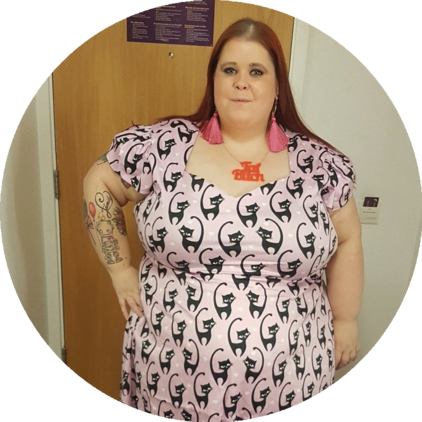 In fact it has even led to a blog post this morning (which I refuse to lead to) which claims that our nation is fat because plus size clothing exists. I asked this blogger what she thought I should do without clothing (if they didn't sell clothes in my size) and her answer was lose weight.... I'm not sure what I am supposed to do in the interim! Anyway, the point is once again that this is all very anonymous. It is SO easy to say that 'they shouldn't be able to wear clothes' and 'they are unhealthy make them thinner' but that doesn't put real people in the picture. I've even seen some one suggest that 'obesity kills' labels be added to all my clothing.. EXCUSE ME!? It's time to remind people that we are REAL people. All we want is the basic right to clothing. I honestly find it baffling that people would take away the right to clothing in my size because I might be unhealthy! So at 8pm tonight I want to do another wave of We Are The They Posts. So get your Twitter and Instagram ready to post photos on your social media.... Let's show those who think we should be denied clothing WHO we are and why we're important! #WeAreTheThey - Make sure you use the tag! #WeAreTheThey and we're not going away!